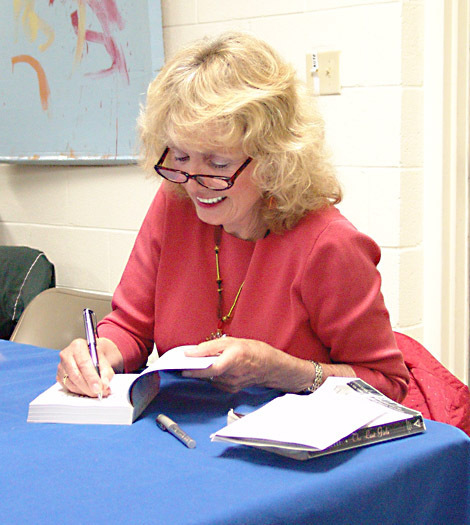 Lee Smith, award winning Southern author, charmed a capacity crowd last night with stories of her life and how a college re-creation of Huck Finn’s Mississippi raft trip led to the writing of her recent novel, The Last Girls. With her warm and gracious personality, she is the kind of person who immediately feels like an old friend. When you meet her, the word that instantly comes to mind is "genuine". After hearing her speak for a few minutes, you also realize that she is dispensing pearls of writing wisdom with every anecdote she relates. If you are a writer or wannabe, you have this urge to follow her around making notes, so that you don’t lose what she is passing out so freely. Animated and funny, Lee is a wonderful story teller. Like her mother before her, she seems to be able to spin a story out of thin air. If you go to her website, you will see her describing herself in her own words. I could have spent hours listening to her. 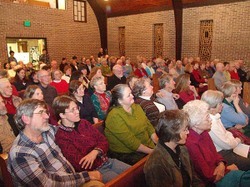 The large audience hung on every word. After her book reading, I bought a copy of The Last Girls and was well into it by the time I got to the head of the book-signing line. She asked if I was a writer and immediately engaged me in a discussion of a novel I have been working on. This was typical of the discussions she had with people during the evening. I think I can characterize her best by saying that she is truly interested in others. It is a refreshing difference to encounter someone with this attitude in life. 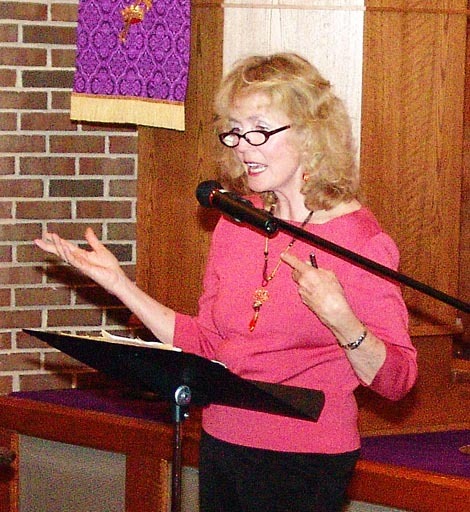 Lee Smith is an inspiration to any writer. She celebrates the joy in life and also sets an example of how to deal with heartbreak and loss. Find out more about this remarkable woman by visiting her website and reading her story. This was the second of five Meet the Author events put on by the Friends of the Library in Floyd. This series of reading and discussions by highly acclaimed authors is organized on the theme Celebrate the Past – Look to the Future in honor of Floyd County’s 175th Anniversary. For different views of this marvelous evening, you should visit two local bloggers who have given their own perspectives of Lee and her work. Go visit Leslie at Top of Squirrel Ridge and Fred First at Fragments from Floyd. This entry was posted in Books, Country Living. Bookmark the permalink. I was there, too! Wonderful evening; I didn’t want it to end. David, Thank you for sharing this. I was intrigued and went to Lee’s website. I read her loving tribute to her son- it tells so much about her heart. I have been really enjoying your blog and the wisdom you so graciously share with your readers. I found you through the great ODBA carnival post that Kilo put up at Spark It Up!!! Be blessed today!